And should be seen by the whole world, as a requirement! This is the story that ‘history tells us all’. It begins in contemporary life. It was very recently made, in these times, so that the viewer can be brought into the narrative drop-by-drop. I’ve studied the history in detail. But the films and writings that were available about this story were not familiar to contemporary people. The films were black & white, very old and often the language was not clearly defined—which is probably why this series of films was made. The entire world needs to see this series for its overview and its humanity. The contrast between the stolen modern state and the lives of the Palestinians is stark. The lives depicted in today’s Israel contrasted with the lives of ordinary Americans today. This needs to be seen in order to see how all those billions that we send Israel are spent. 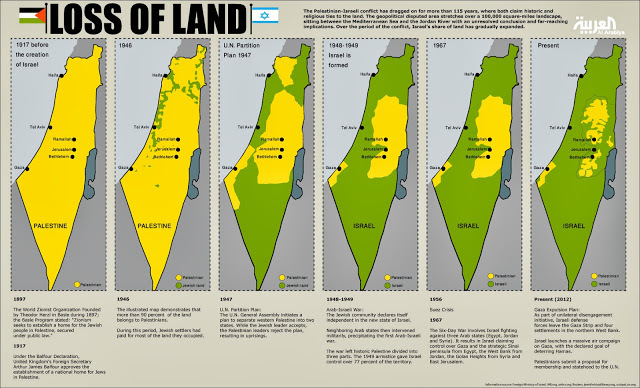 The way that Palestinian lands are stolen and then enforced becomes much clearer herein. For those interested in this convoluted history it’s worth noting that contemporary-Terrorism was invented by Israeli’s and was viciously used against the British occupation. Israel terrorists referred to the British as Nazi-occupiers. Before 1945 ‘Terrorists’ and Terrorism had become almost an unknown term. History flows like a river from a trickle high in the mountains to become the rivers that eventually flow into the oceans of the world. The history of the Jews in Palestine is contorted by the politics of WWII and the end of that war, which continued in Palestine for the British, in their military-occupation of Palestine. Many of those Jews served in the British Army during the war and actually learned many of the tactics which the Irgun and other Jewish terrorist groups used against the British after the Nazi’s were defeated. But the European “Jews” that were imported into Palestine formed the root of the disease that is plaguing the planet today. What makes this story so vital, and so complex is “the diary” of one of those who was in that occupation of Palestine, which is being read and followed closely by the young British woman, who is trying to make sense of the rage and the criminality of the mob that runs Israel today. The Diary is the key to this because it lets the viewer go back and forth between the 1940’s and today’s Israel. In Israel, whether events happened back in the 1940’s or today, many of them remain inexplicable to many people. The eviction and the poverty of Palestinian’s plays out in this episode, and partially explains how Israel can claim, as they still do today ­ that the Palestinian’s were poor ignorant people who did nothing for their land. That’s because the Jews took their homes which had been there hundreds if not thousands of years, leaving those who had owned the land to forage for themselves amid the barren lands which the Jews denied water to, thus Israel was able to create a myth that is still believed to this day. k- However the film does not mentioned the WAR that the Jews declared upon the State of Germany ­ which was financial, physical and real. This has largely been scrubbed by those that do not want the world to know about it. This part of history in the 1930’s was unmentioned. But the public-attack by the Jews, in Germany, gave Hitler his opening to become the Fuhrer. That part of history was not in the Diary which was begun in the 1940’s. After you’ve seen the whole film, there are a couple of things that might expand what this piece of history brings to those who take the time to understand the complex dichotomies; which make this “PROMISE” something that few who have seen it will ever forget. The Jews have a much longer history than just Israel to answer for. 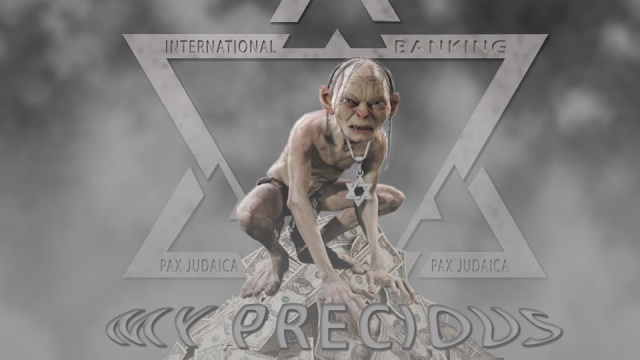 For centuries the Jews have been trying to take over the planet by way of using money to control and dominate the world. Shakespeare wrote about it in The Merchant of Venice, but there have been hundreds of historical references to what these moneychangers have tried to do to the world. The Russians have paid several times. The Germans too have paid time and time again for dealing with them. In the case of the Germans, after the First World War, the Jews took advantage of what the Allies did to Germany through the Treaty that ended that First World War The German people were then put into the exact same position that the Americans are about to undergo, when their money became absolutely worthless. The difference is that the Germans had a screwed up leader, in Adolf Hitler, who was looking for financing to create his Third Reich. Hitler made a deal with International Jewry, to finance his bid for power in 1932. The pact was signed, before the German Republic reached the point where Hitler took over. The difference between Americans today and the Germans in pre-World-War II was that the Germans fought the Jews, and pulled away from them for awhile; whereas it looks like Americans will choose to stay in bed with these global-war-criminals, that could relegate America to what happened to the other nations which the Jews have savaged down through history. A full third of the Nazi SS were Ashkenazi Jews. It was those European transplanted Jews that made the arrests and reveled in the treatment of Jews. Their actions were internationally publicized, so that after the war, there would finally be a state called “Israel”. The Jews themselves made this clear to the world even before the Brits left Palestine. What “Israel” did to the Palestinian’s in Palestine was hundreds of times more brutal and insane than anything the Nazi’s ever did - during the twelve years of the Third Reich. The Palestinian nightmare has lasted for 65 years! The Jews have been doing what they do for centuries, and the way they live today, like royalty, can be seen in the film. This makes their behavior toward the wider world all the more hateful for the rest of the planet which is being subjected to the dictates the blackmail and the extortion of the Jewish state. The armor-plated bulldozers that have ravaged so much of the Palestinian State, and murdered so many civilians are made by Caterpillar and they are clearly marked “Made in the USA”. Americans need to think about that, long and hard. But then most of the weapons Israel uses today are also “Made in the USA”! After watching these four films, you need to remember how many times these Jews have defied all the global-conventions that are supposed to govern human-behavior ­ but that somehow are never implemented to even slow the savagely inhuman Ashkenazi Jews. Every nation that has anything of value to lose, must eventually fight the Jews to keep anything of whatever they have built anywhere in the world. The last stand for Israel with be here on American soil because the only way out of this moneychanger-trap that we have allowed Israel to put us into - is to defeat the Jews. Because the Dead Can’t Win! 1) Palestine a tragedy unfolding will this be America’s fate?